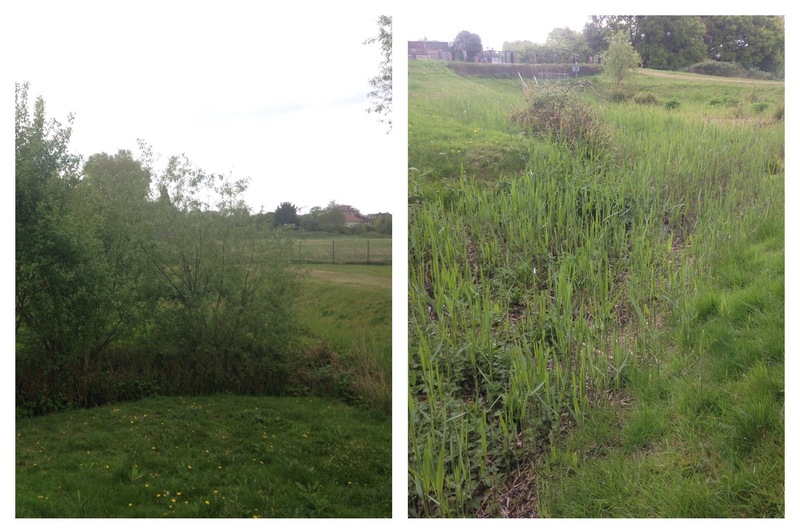 Last week we left Well Hall Stream in slight suspense – just outside Well Hall Pleasaunce. 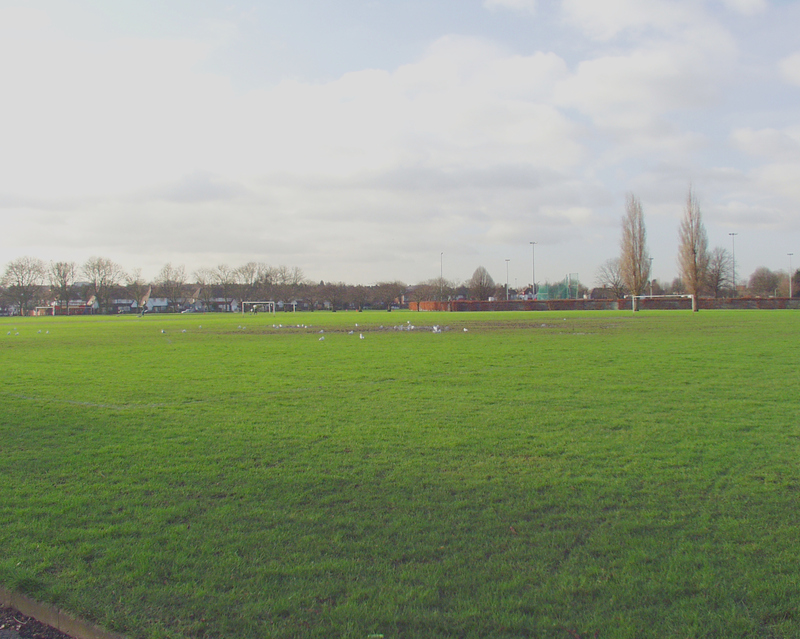 The public park dates from the 1930s when William Barefoot, persuaded Woolwich Borough Council to buy the current Pleasaunce. The centrepiece of the park is the Tudor Barn, which despite its name dates from the early 17th century, although previous moated buildings on the site can be traced back to 1253. Running Past has visited the Pleasaunce before, when tracing the homes of E Nesbit in Lewisham and Eltham. She lived there between 1899 and 1920 at Red House, which was demolished when the Pleasaunce was created. 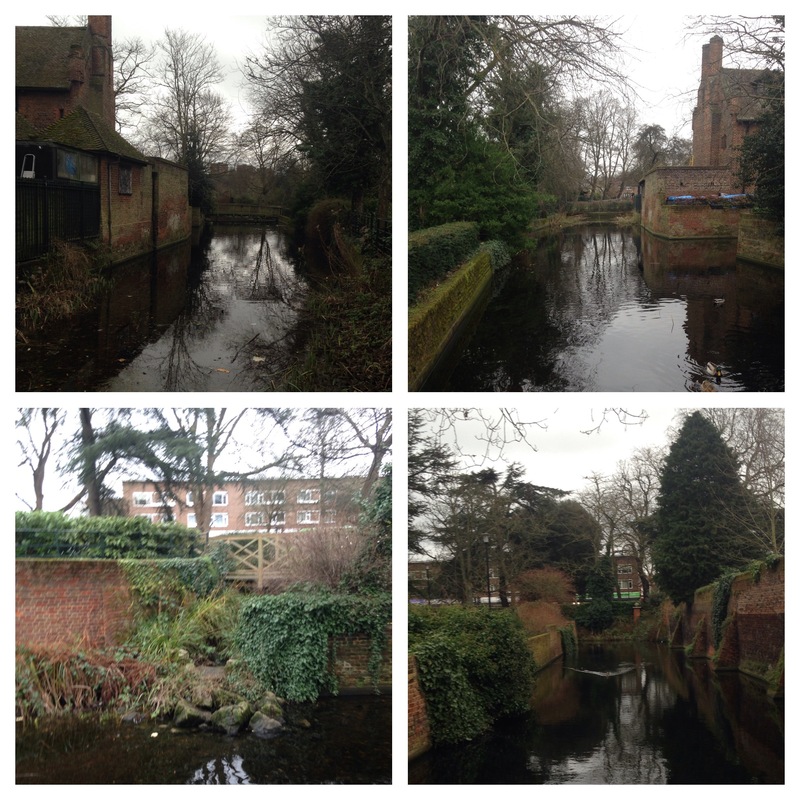 The gardens were designed by the Borough Engineers, J Sutcliffe and H W Tee, the former gave his name to Sutcliffe Park, a little further downstream. 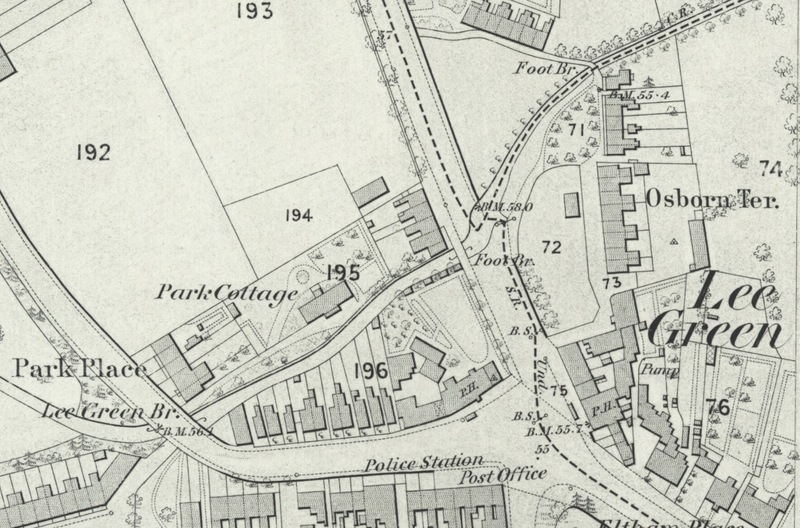 Well Hall Stream seems to enter via the moat, or originally did – possibly along with smaller streams from the North and North East – older Ordnance Survey maps seem to suggest this. 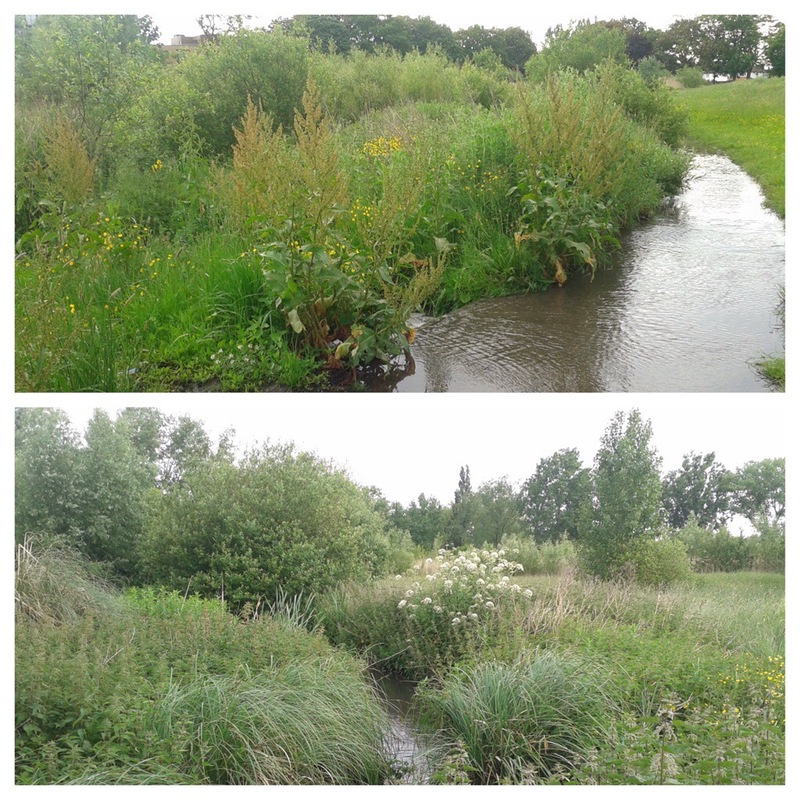 There is a small trickle coming in from the right direction (in the bottom left picture below), whether it is the remnants of the Stream is unclear though. 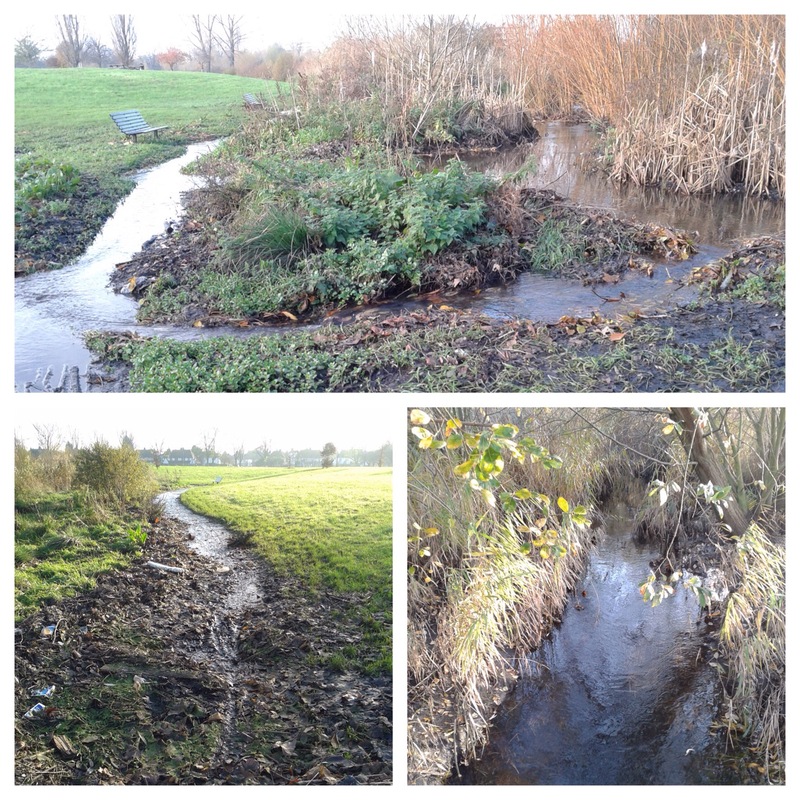 There is a clear direction of flow for the Stream away from the moat – but there is no running water in it, perhaps it flows in really wet conditions, only little bits of dampness were visible. 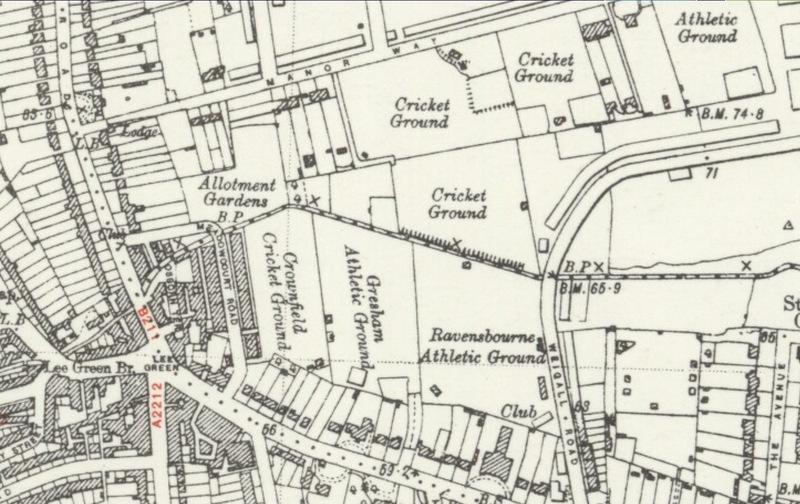 The course of the stream would then have been more or less westwards, skirting the edge of playing fields before being crossed by the A2 and railway in quick succession. The original route would have then taken it through some neglected woodland sandwiched between the railway and Horsfeld Road – amidst the detritus, a ditch is visible, but dry. 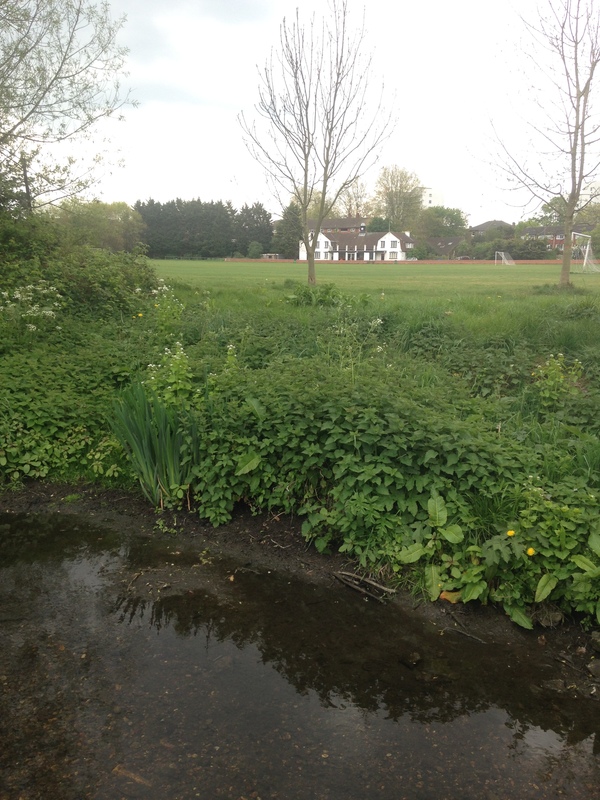 The Stream would have crossed the South Circular and then meandered through the Eltham Green estate, there are hints of a course with a slight dip near the junction of Pinnell and Shawbrook Roads. 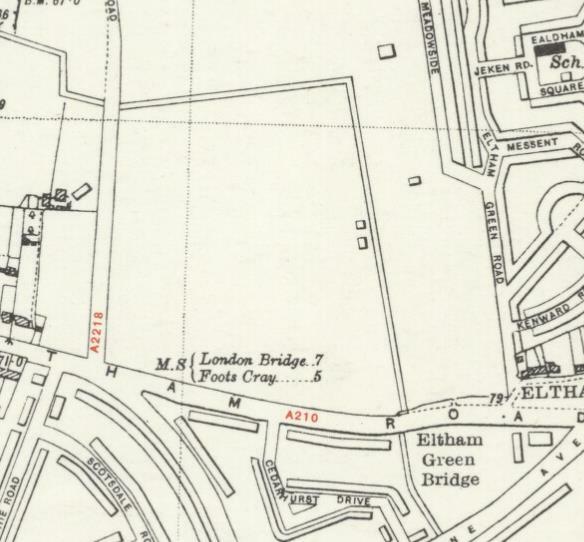 It probably crossed Eltham Green Road near Messant Road before joining the Quaggy in Sucliffe Park. There is no current evidence of an confluence, the stream probably having been diverted a century ago. 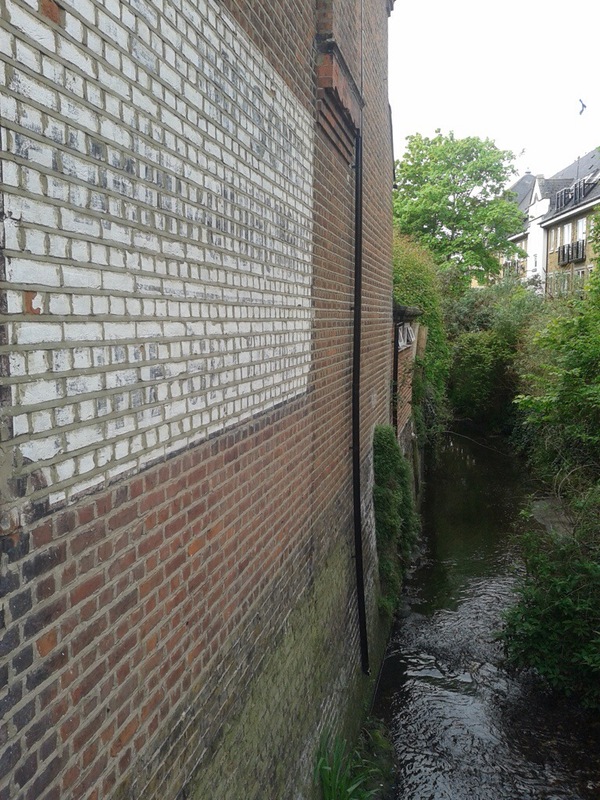 Ken White (1) suggests that there was another small tributary of the Quaggy in this area – Eltham Green Ditch. 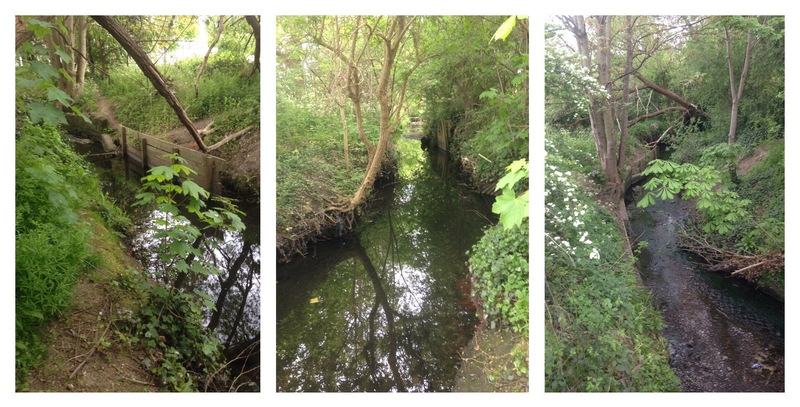 Certainly there was a stream around Eltham Green which is clear from Victorian Ordnance Survey maps. 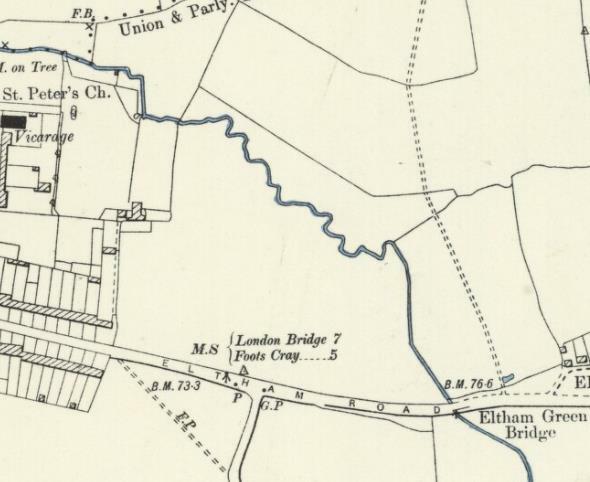 However, my reading of the OS map surveyed in the mid 1860s (see below) is that it seems more likely to have been a partial diversion, a distributary, of the Well Hall Stream as it exits Well Hall, which then joined the Quaggy close to Eltham Bridge, just before entering Sutcliffe Park. 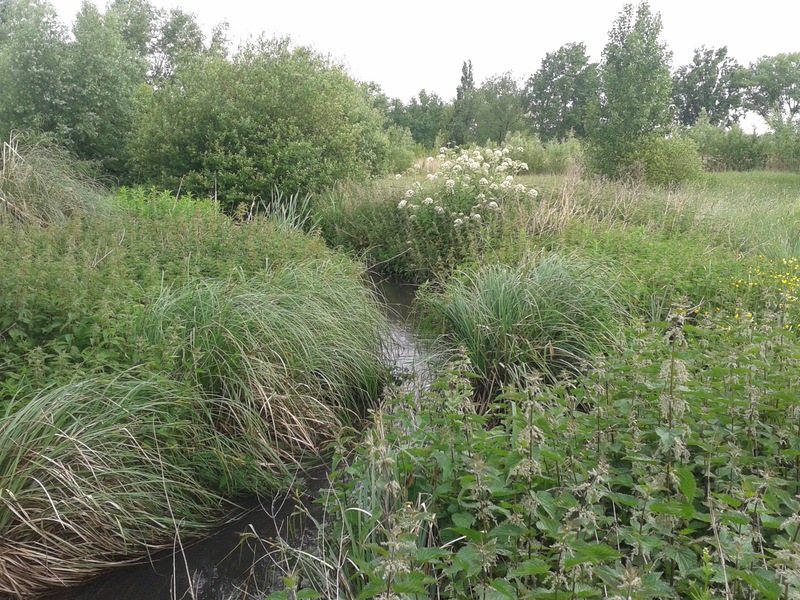 As has been noted by in the Thames Facing East blog, Kidbrooke was marshy farmland covered with drainage ditches and several small streams (several already covered here before) so it is difficult to be totally sure. 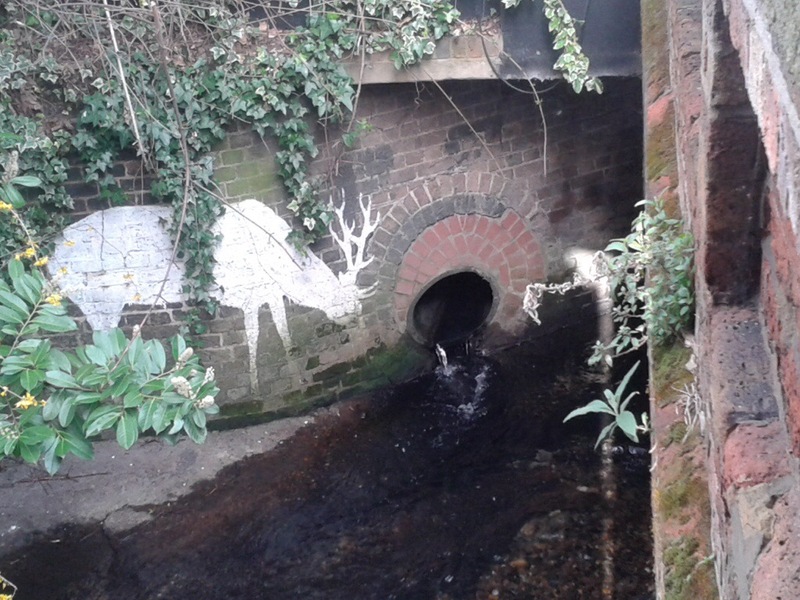 This entry was posted in Rivers and tagged Eltham, Kidbrooke, Quaggy, Sutcliffe Park, The Quaggy, Well Hall Pleasaunce, Well Hall Stream on February 17, 2016 by Paul B. Rain stopped play is not something that is associated with running, particularly cross country a discipline where rain and mud are generally considered a positive feature. 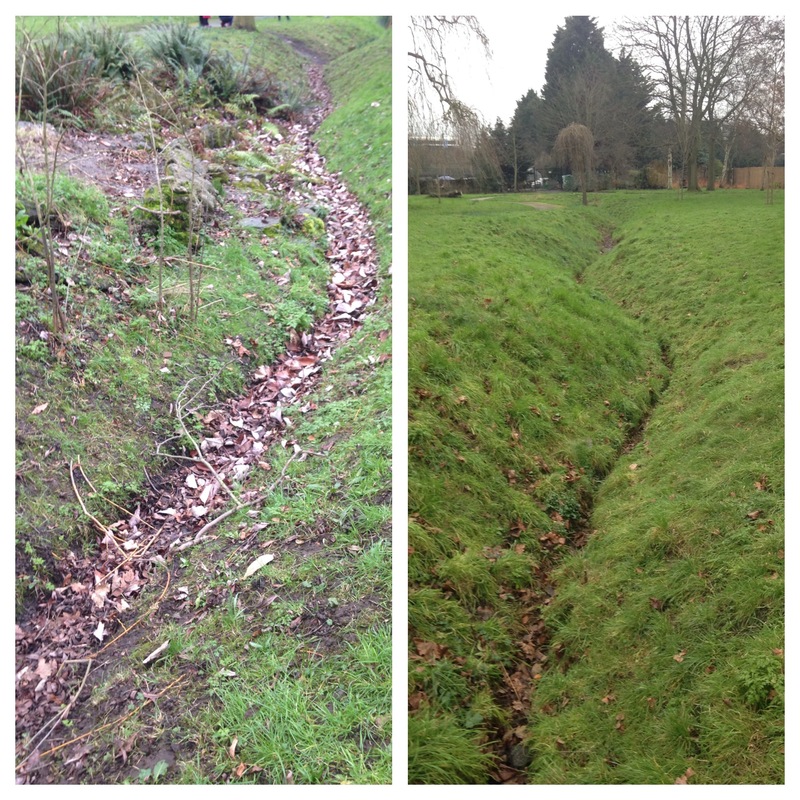 So it was rather surprising to receive an e mail on Friday confirming that that Saturday’s fixture in the Kent Cross Country League in Danson Park had been cancelled due to a waterlogged course and concerns about damage to the park which would have impacted on other park users. 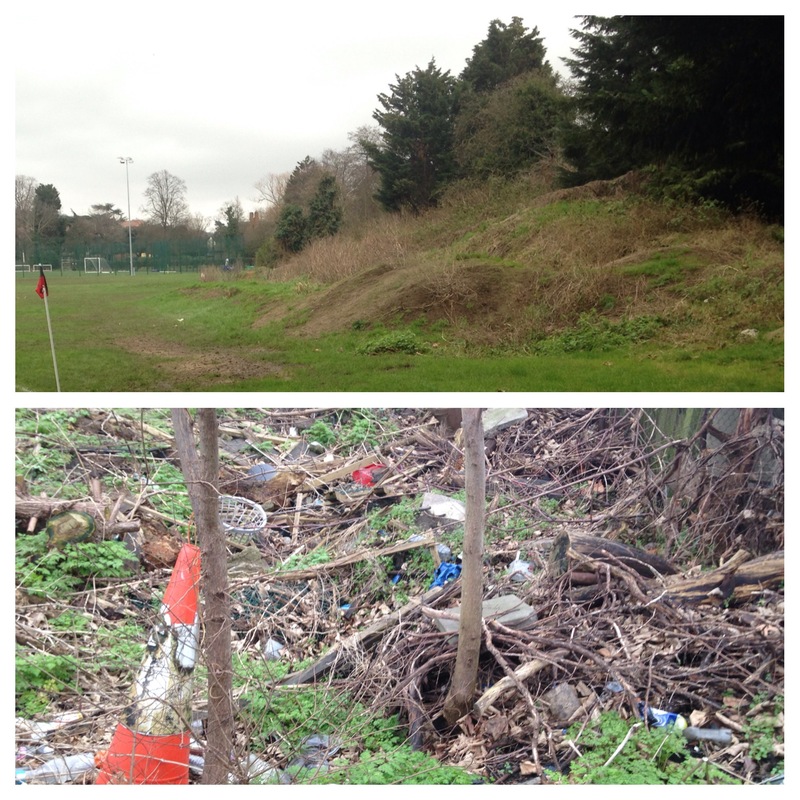 While disappointing, it is understanding and shows the problems of finding suitable venues for cross country races. So instead, I headed out this afternoon to do a tempo run around the perimeter of Sutcliffe Park. 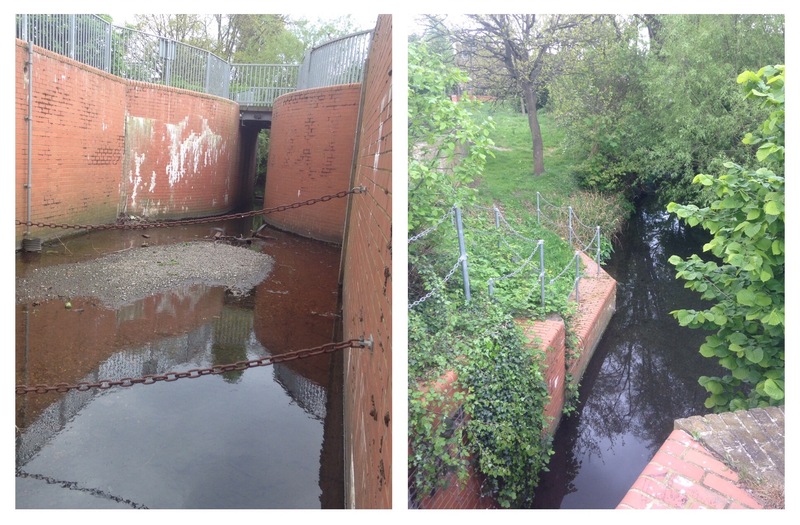 The Quaggy runs through the park had clearly flooded last weekend and its level was still higher than the path alongside it. 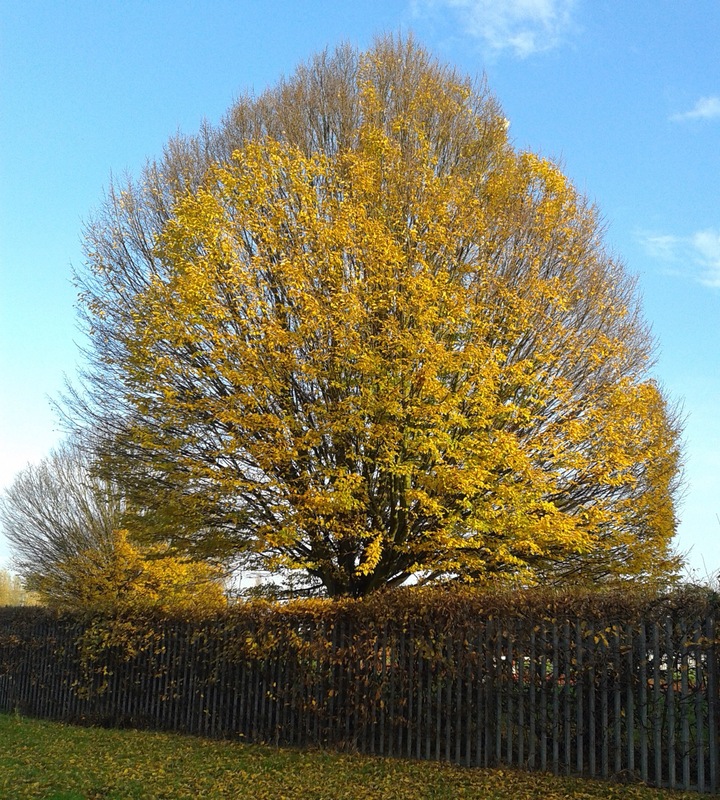 There was still the very last vestiges of autumn colour on the edge of the athletics track, the yellows glorious in the afternoon sun. My own disappointments pale into insignificance with events in the sport that ‘Rain stopped play’ is more generally associated – cricket. That sport had a tragedy this week, with the death of the Australian Test cricketer Phil Hughes, struck on the neck by a bouncer, which just evaded the protection of his helmet. I have’t played for years or been to a game for a couple, but his death touched me greatly, particularly listening to the veteran Australian commentator Jim Maxwell announcing it. There was a piece by Tom Fordyce on the BBC website that perhaps explains it ‘Elite sportsmen are our real-time superheroes, capable of physical wonders beyond the rest of us, seemingly unbound by many of the same biological constraints.’ They are the people we aspired to be when younger, but without their talent and commitment we remained ordinary sportspeople. The sporting community’s tributes #putoutyourbats has produced some moving images, and recognition that bowler who innocently delivered the fatal ball, Sean Abbott, will probably suffer for the rest of his life. 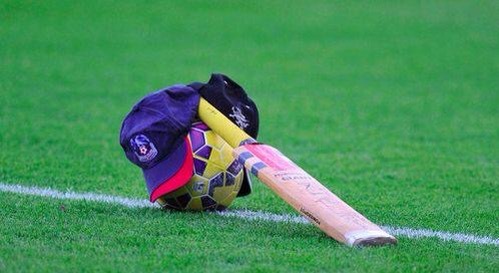 I was going to dust down the family bat, but the tribute left at the side of the pitch at Swansea (picture from The Mirror) by the Palace and Australia football captain Mile Jedinak seemed so much more poignant. This entry was posted in Rivers, Running and tagged #63*, #bringoutyourbats, Kent Cross Country League, Phil Hughes, Sutcliffe Park on November 29, 2014 by Paul B.
It’s nearly three weeks since I last posted about my running, the recovery from the lateral collateral ligament strain picked up during the London Marathon has been slow to say the least. Until this week that is, a week ago I was considering having a complete break for two or three weeks but over the last 7 days it finally seems to have cleared up with nothing felt in 5 runs including a tempo run today round a rather soggy Sutcliffe Park where The Quaggy was rather full and one of the paths had become a temporary tributary. 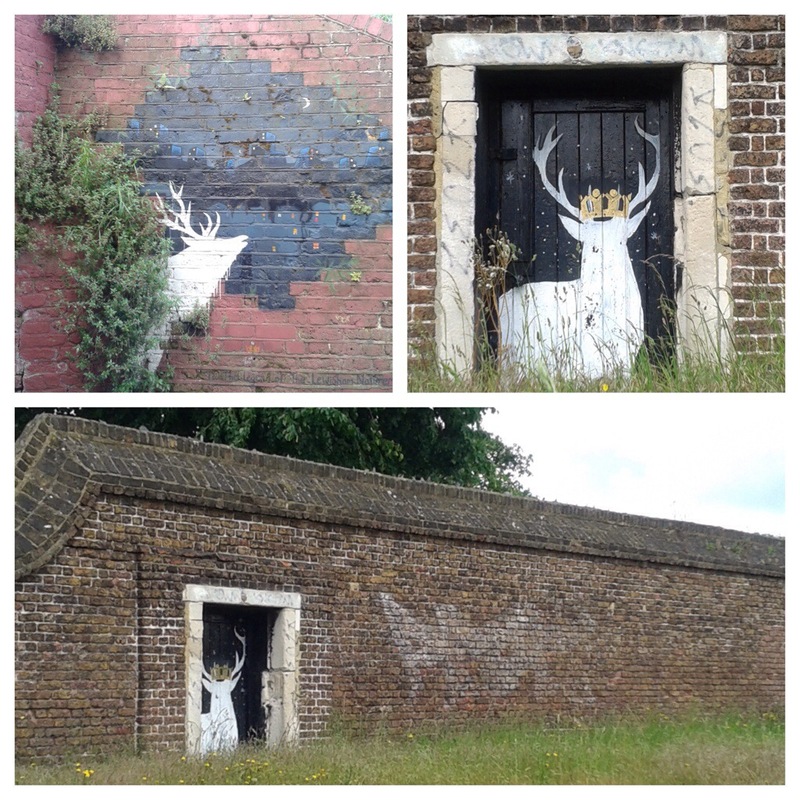 The second, less than a mile away, wearing the Saxon Crown of the Borough’s badge, is on an abandoned gate in a listed wall on Blackheath, which, despite being able to walk around, has its own crown of broken glass. 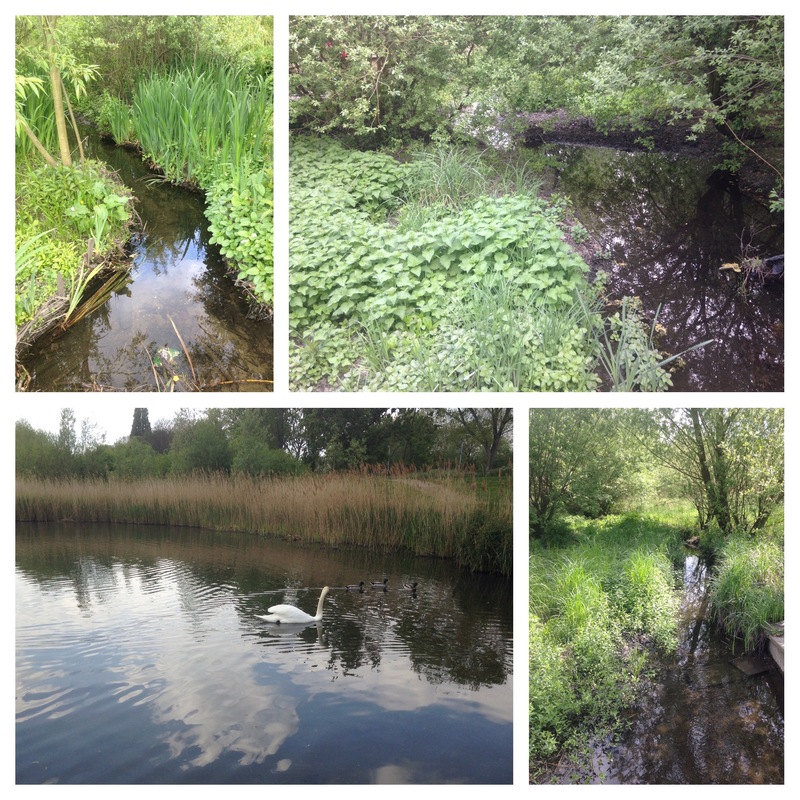 This entry was posted in Rivers, Running and tagged Lewisham Natureman, Quaggy, Running, Sutcliffe Park on May 26, 2014 by Paul B.